I have been drinking Julian Tai's Dragon Well teas for the last two seasons. I have been curious if the Gong brand could stand up against Julian's teas. Locally, here in Stockholm, I found a Gong A Grade Exclusive "Tribute" West Lake Longjing green tea, and bought a box for the price 20 Euros for 50 grams. The A.Exclusive is the highest grade. Julian's Jipin grade costs 41.95 USD for 50 grams. In this review I tested the A.Exclusive against Julian's Jipin grade. I did this with my usual wine testing method, and brewing the teas in three different temperatures: high, medium and low. The Jipin grade was picked from 19 to 20 March 2008, and the A.exclusive was picked between the end of March and until April 5 2008. Both teas are organic. Before I start the review, I would like to say a few words about the word "tribute". 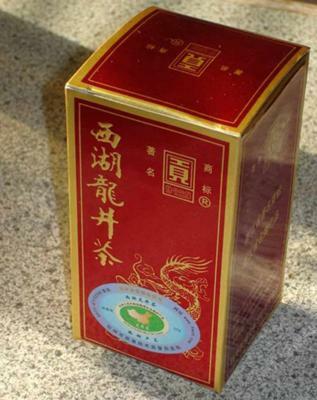 To me tribute tea is a tea that is of such a high quality that it was sent to the emperor of China. Today there is no emperor, the Chinese White house consumes it instead. First time I read about "tribute" tea I thought that it actually was the same as tribute tea, but that is not the case. After doing some research, I found out that "tribute" is actually a brand name, and is not a tea of emperor quality. Still, the "tribute" tea is from West Lake, and as the most renowned Dragon Well teas come form West Lake, it was very interesting to see how the "tribute" would stand up against a real tribute tea. Yes, Julian's Jipin grade is of tribute class. The A.Exclusive tea leaves are smaller in size and a bit more brownish compared to Julian's Jipin grade. Almost half in size. Tasting the leaves, I found that both teas taste sweet. Both teas are also bitter but the A.Exclsuive is almost overwhelmingly bitter. The smell from the A.Exclusive is nice and clean with a weak smell of hip. The Jipin grade also smells nice and clean with stronger smell of hip. The Jipin grade has more of everything. The A.Exclusive is kind of muted. 1) Using 100 ml of soft 95 deg C water and 2 gr of tea leaves and brewing times of 2, 4, 6 minutes with the tea cup covered. 2) Using 150 ml of soft 85 deg C water and 3 gr of tea leaves and brewing times of 5,3, 1.5 minutes with the cup covered for these times, and after each brewing 1/3rd was left in the cup for the next brew. The A.Exclusive tea is very sensitive to the water temperature. Brewing it at 95 deg C draws out the bad sides of this tea. The smell becomes a bit sour. It still smells of hip and algae like I am used to from other Dragon Well teas, but the sour smell is something I cannot stand. The Jipin grade on the other hand has no problems with 95 deg C water temparature. It gives out a powerful smell of hip, algae, and nuts, and the taste is mld, buttery, sweet with no bitterness. The taste of the A.Exclusive is also sweet but bitter. It is interesting that on the 3rd infusion, the bitterness of the A.Exclusive is gone. For the Jipin grade the nutty flavour is gone after the first brewing, and out comes other smells like wet grass and more fruity smells. Continuing with brewing style (2) the A.Exclusive is better with less bitterness on the first infusion, and in infusion two, there is no bitterness at all. Also, the sourness is gone on infusion two. Instead the usual smell of hip and algae is there, and the taste is sweet and mild. In contrast the Jipin grade is perfect on infusion one with a nutty and oily smell together with a smell ofhip, and the taste is creamy, mild, sweet, with a long nice aftertaste. For the third infusion I tasted a weak bitterness for the A.Exclusive. Finally, brewing style (3) is the one I prefer as there is no bitterness nor sourness present. However, neither taste nor smell comes close to that of the Jipin grade. It is as if the low temperature cannot extract the full potential of the A.Exclusive, but when used with higher water temperatures bitterness and sourness comes along with the good sides, too. Still, the A.Exclusive is not a bad tea. It just is not up to par with the Jipin grade. For all brewings, the Jipin grade tea is a bit more clear, and the A.Exclusive tea colour is slightly more brownish. But both have a nice colour. I must admit that I had hoped for the A.Exclusive to be of higher quality. Compared to the Jipin grade it is of lesser quality. Among the three styles, I feel that the high temperature brewing brings the best out of the Jipin grade. Now, the Jipin grade costs a little bit more, so is it worth it? I say definitively yes. It has more of everything and it is much less picky of brewing style. A is not the highest grade for Gong brand, they have a Jipin as well. I'd like to see a fair matchup between Julian's and Gong(tribute) brand. Joey, thank you for your concern. I appreciate it. Sigurd is my customer, and he has been very kind to contribute his experience and knowledge in a sincere and genuine way. The article is very transparent about the grade and price he is comparing, so readers can derive suitable conclusion from this comparison. I hope you are not reading any more than what it already says. In the subjective world of palate and taste buds, smell and aroma, tingling sensations and bitter taste, we can only engage conversations with a spirit of generosity, understanding and tolerance. Doing anything else would be counter productive. This article is not attacking the Gong brand company. Sigurd is simply sharing an experience of a moment. What's valuable about this voluntary contribution? In my humble opinion, the article describes a comparison method which can be applied to other types of tea - so it is worth reading. - It is widely known by the Lion Peak Mountain villagers that the Gong brand no longer collects tea there in the 2009 season. - Thus for the 2009 crop - the word Gong, which means Tribute - is merely a trademark. None of the tea comes from the Tribute tea gardens serving the Chinese White House. - Like all other "famous teas", the Gong Brand may have succumbed to the curse of success - i.e. because it is become a very popular brand in China, it no longer find it economical to source from the highest quality tea gardens. - Instead, it now sources from third rate West Lake villages such as Longwu. It is also well known by the locals that 10% of the tea is diluted with other teas produced outside the West Lake region. In other words, its popularity has made it more mediocre, in order to cater for a wider audience at lower price. This is what I would call the Paradox of Famous Tea. No doubt they have blended their teas with great skill - so they are still worth trying. Even a third rate West Lake tea is still a genuine West Lake. The bottom line is that the Gong brand is evolving - it is no longer the award winning enterprise 5 years ago. It has become much more commercially successful. Another reason why an objective test is hard to achieve in the tea world. Whether its quality is better or worse depends on your personal preference. If you want the cup of tea that the Chinese president is drinking, I would recommend going directly to one of the Tribute Dragon Well tea gardens - such as HQ's, than through a commercial brand such as Gong brand. Especially when the commercial brand produces none of its own tea, and merely does the packaging and blending. At the end of day you have to taste several products before you can decide which is best for you. Just like what Sigurd has done for himself, and kindly shares.